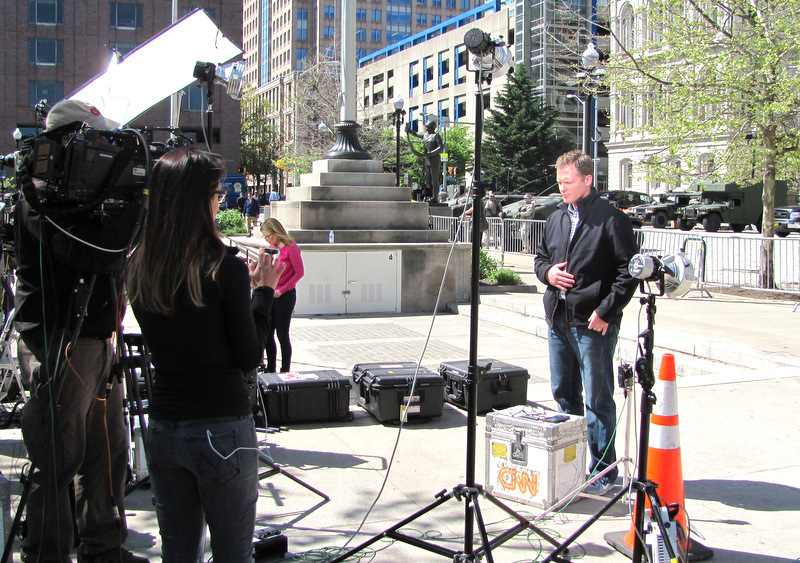 When CNN and other out-of-town press roll into your city, absurdity can roll in, too. With church folk and dancers out calling for peace and fist-bumping the troopers, the daytime atmosphere was less Mad Max than mellow street fair. Plus there’s the pesky fact that Rep. Cummings is a West Baltimore native who may know this neighborhood a wee bit better than the parachuting correspondent. Local residents and politicians have been playing a game of whack-a-mole, trying to swat down the simple-minded (and often nasty) national narrative, with its heavy focus on looting and hurled rocks and fuzzy forgetfulness of the severe breakdown of police-community trust that preceded the rock-throwing. 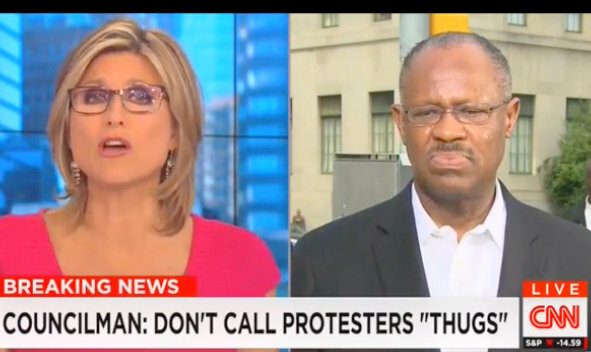 CNN’s Erin Burnett yesterday pressed City Councilman Carl Stokes about the use of the word “thugs” to describe the young people hurling objects at police around Mondawmin Mall. “Isn’t it the right word?” she asked. Burnett went on to challenge Stokes on his remarks. Stokes paused and then let it rip. “C’mon? So [you’re] calling them thugs? Just call them n______ ! Just call them n_____!” Stokes said, indicating that that was essentially what Burnett was doing. Today CNN’s Ashleigh Banfield took her turn to defend the (by now hopelessly racialized) word “thugs,” and lectured Stokes for using the n-word to condemn it. But perhaps the lengthiest exchange was between Baltimore activist DeRay McKesson and CNN host Wolf Blitzer. “Remember, the people that have been violent since August have been the police. When you think about the 300 people that have been killed this year alone. Like that is violence,” he said. Perhaps comedians have had the most incisive commentary on events in Baltimore and the coverage by some of the mainstream press.